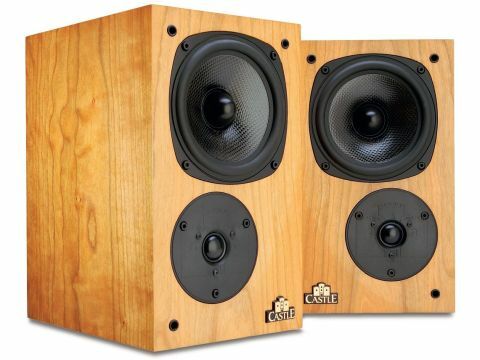 Castle Acoustics is a stalwart of British hi-fi speaker manufacture, renowned (rightly) for the originality of its designs, but most particularly for the excellence of the top-quality real-wood veneerwork that it utilises throughout its Classic range. The Richmond 3i is a prime example of that range; it's available in an impressive variety of different veneers, mostly at the 'standard' £320 per pair asking price. The latest in a long line of relatively affordable Castle luxury miniatures, this latest Richmond is slightly larger than its predecessor, in order to compensate for the fact that some of the enclosure interior is now taken up with bituminous damping pads. We first looked at this model some two years ago, with very positive results, and the speaker has subsequently grown into something of a cult among consumers and trade alike. However, the small size does suggest it may be better suited to smaller rooms than the medium-to-large (4.3x2.6x5.5m) room that we used to test it. It's a two-way design, loaded by a rear port situated below twin terminal pairs. The drivers are inverted, with the tweeter below the bass/mid unit for optimum integration when standmounted, and both units are neatly flush-mounted into the front panel. The tweeters are also offset from the centre line, the better to distribute baffle-edge diffraction effects, so the enclosure pairs are mirror-imaged to preserve left/right symmetry. The pair is normally installed so that the tweeters are closest to the inside edges. The classy main driver has a cast frame, large magnet and a cone made from a polymerised woven carbon-fibre matrix. Said cone, however, is only 100mm in diameter, and therefore one of the smallest in the test group. While this inevitably compromises its ability to physically move large quantities of air, and will constrain bass headroom and extension to an extent, a small cone is more likely to preserve its rigidity towards the top end of its operating range. It will also aid wide sound distribution near the crossover point. The tweeter's 19mm polyamide dome diaphragm is also smaller than the average. Initially auditioned in isolation, this pretty little miniature immediately impressed with its notably even and well balanced sound, and freedom from unwanted boxiness. Most significantly, it is unusually smooth for such a modestly priced speaker, and that major strength sets it well apart from the pack. Although it delivers a lovely smooth balance on stands well clear of walls, perhaps inevitably there's an obvious shortage of bass under these conditions. Mounting the speakers close to a wall boosts the bass and helps the all-round balance significantly, though this also adds a little chestiness and thickening in the upper bass region, and somewhat compromises the midband smoothness by adding a little coloration here. One relevant observation is that the Richmond 3i is likely to work very well when used clear of walls and with the bass augmented by some sort of additional subwoofery. Voice reproduction is this speaker's real forte, however, as it makes speech in particular sound beautifully clean, natural and unexaggerated. Imaging too is precise and well focused. But the downside is that dynamic grip and tension tends to sound constrained, and contrasts seem slightly diluted. This is not the most vivid or exciting sounding speaker around, in terms of dynamic expression and contrasts, though it does make up for that with its subtle sweetness, delicate neutrality and superior imaging. Our measured sensitivity for the Richmond 3i comfortably matches the manufacturer's specified 88.5dB, and this is achieved without compromising the load that the amplifier has to drive. The use of a generous main driver magnet, however, has the down side that bass extension tends to be somewhat curtailed. Even with the assistance of room modes and port output, average output falls off quite markedly below 120Hz when the speakers are mounted on open stands clear of walls. Moving the speakers back against a wall helps to fill in the midbass and gives respectable extension down to around 50Hz, but at the same time it does rather perturb the exceptional smoothness of which this speaker is capable. In free space, the room-averaged response held an impressively smooth /-3dB, but the bass region is significantly less smooth with wall assistance.